Mimics the look of the engineering and security red uniforms Scotty and Uhura wore in the original Star Trek TV series! Measures 5 1/2-inches wide x 3 1/2-inches tall. Features nylon lining and stitching with the command symbol on the upper right hand side. Match your uniform! With spot metallic printing and nylon lining and stitching, the Star Trek Original Series Red Uniform Coin Purse is not only handy but cool and high quality, too! The coin purse measures 5 1/2-inches wide x 3 1/2-inches tall. 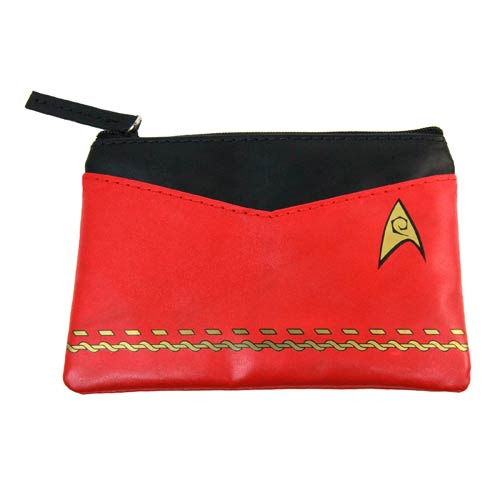 The Red Uniform Coin Purse is made to look like the engineering and security uniforms from the original Star Trek TV series, with the symbol on the upper right hand side. Also featured are a front non-zip pocket and a hidden split ring in the back zip pocket.